It's getting late. It seems like an eternity since I last saw him. I hear his footsteps getting closer. I quickly get up. As I get closer to the hallway, I hear him fumbling for the keys. He bursts through the door just as I reach him. I wonder how his day was? He loves to work, but sometimes I worry he doesn't play enough. You know, it's exhilirating and relaxing to throw a ball around. He's really busy with a "new project". That's all he seems to talk about. Who is he? Well, the one and only Ian Clarke. He was one of the founders of Revver.com. He loves what he does and I get to watch him on TV now and then. He's been on several shows debating topics concerning the internet. He's also involved with several companies on the web. Yup, he's a visionary in that new frontier called the "world wide web". Along with visionaries like Ted Murphy and Dan Rua, he pushes the limits of what people believe can be done in the blogosphere. Imagine the surprise when he created a site where people could submit video content and get paid for it! Back to his entrance. He sat down with his favorite dinner, lemon chicken. I watched him from the corner of my eye as I devoured my dinner. He started to talk about his desire to create a site where people could submit news stories while popularity would be reflected by the truth. I don't know who this Truth person is, but he sure does talk about him a lot. Often, while he pounds the keys late at night-he smiles while talking about his new project and "The Truth". Quite frankly, I was getting a little jealous of "The Truth". "Thoof will be the name for this new site that will give the whole truth about news and information shaping the world." Who am I? My name is Dillon. 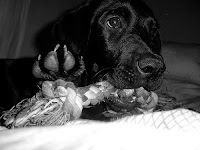 Here I am with one of my favorite toys! There. Now you know all about us. Be sure to visit Thoof and tell my Daddy how cute I am! Thoof.com is a site that combines the ideas behind Digg.com (minus the mob mentality) and wikipedia. Anyone can open an account and submit content. Each URL is given a title and description by the submitter. The community can change the title and description by adding or substracting to it (this is called making an improvement). That aspect resembles wikipedia. Ultimately, the decision as to whether the improvement is made or not depends on the community. To have your readers particpate in the content you've submitted, you simply oplace a ThoofRank buttin on the bottom of your post. The rank is a measurement of how interesting a story is to readers with interests in common with the story. The most creative part is that the site remembers what content you found interesting. When someone submits a story that is similar to the ones you clicked, it will show up on your page. This site will produce personalized news! If you don't want to read the news story, you can hide the story or flag it as "not interesting". Visit the site and open an account. This site has the potential to send you lots of traffic. Imagine if you would have been one of the first users of digg. My suggestion is that you start "thoofing" right way!